For anyone starting out in business, it is easy to get caught up in trying to book any and every client that comes your way. The downside of this is that it can lead to burn out quicker than you've ever imagined. Abby of Abby Grace Photography loves what she does and has found a way to say 'no' that allows her to step away from burn out and towards success. Learning how and when to say 'no' for your business will be a game changer in the long run. It allows you to set boundaries in your business that will also impact your personal life. Saying 'no' to things that don't align with your business and brand will allow you the time and energy to say 'yes' to the right things when they come along. Abby took a dark room class during her junior in college which taught her about developing film and making prints. She fell in love with photography during this time as something special just for her. After talking with her professor, she decided it was something she wanted to do as a career. Fall semester of her senior year, Abby reached out to several photographers about working with them and began to work with one as her main mentor that first year. She stayed in her communications major which has helped her in her business as well. Her communications degree has still played a role in her business today. Most people tend to equate 'no' with negativity. But Abby believes there is actually freedom in saying no. The typical mindset on the negative side of saying 'no' causes creatives to think that if they say it too many times then their business will dry up. However, you should be using 'no' in more a of protective way; think of they way a parent tells a kid not to touch a hot stove in order to keep them from getting burned. It can be used to protect you from certain things (which we'll get into later). Others don’t say 'no' because they feel like it is easier to say 'yes' rather than explain why they should be saying 'no' or simply out of fear for hurting someone else's feelings. Saying 'yes' in these situations can lead to resentment towards what you said yes to. It is hard for photographers to say 'no' to friends and family discounts, but Abby wants you to know discounting your services allow customers to devalue your business and second guess your expertise. Abby has 2 reasons for ever discounting her photography - 1. are they close enough to be in her wedding party if she were to redo her wedding right now; and 2. when she feels led to offer one. If someone asks her for a discount, Abby believes there is already a level of distrust and devaluation going on and feels confident saying 'no' to the offer. Now that you understand why you need to say 'no', you need to determine how and when you say it. Here are two questions Abby wants you to think about for each inquiry you receive. What is your hesitation for saying yes? Is there a red flag you’re already aware of? If you don't want to say yes immediately, there has got to be a reason deep down that wants you to say no. Be honest with yourself and then be direct with your response. Reasons for saying 'no' can come in all forms and will be different for every person and inquiry. Take the time to evaluate your hesitation before moving forward (especially if there are red flags!). Where you are in your business and what do you want to focus on? Do you love weddings, maternity sessions, or families? When you’re first starting out, it can be hard to figure out what you love and the next thing you know, you've said yes to 10 different types of sessions. It is okay in the beginning to some extent, and when you have a slower season, but you need to check in with yourself every few weeks to see what you’re loving and what is doing well for you financially. Abby believes you can and should start saying no early on in your business. Just because someone requests information doesn’t mean you have to book them. Start building out your referral list too, so you have other photographers that might be a better fit for those inquiring with you (style, budget, date, etc). Many clients will be more appreciative of your honesty when they’re not a good fit, than having feelings of resentment towards photos you don’t really love. Abby recommends saying no early in the inquiry process. Going back on your word is not something she recommends and again, it keeps you from resenting your 'yes' later. Don’t make it personal and about them, but be direct and let them know it doesn’t fit in with your business plan, For example, if you’re a wedding photographer and you get asked to shoot a first birthday party, kindly let them know you are flattered at the request but that you don’t shoot birthday parties and offer up a name or two of photographers who do. If you say 'yes' and the day of the birthday party arrives, you may find yourself resenting the event and not want to go any more, but you can't go back on your word. This is covered a lot in this episode, but offering up a few names of other photographers is the best way Abby recommends ending a 'no' response. Remember you want to love what you do and if someone is asking for a different style than you typically shoot, that should be an easy 'no' and easy referral. Photographers don’t have to be in competition with each other. Get to know other photographers and what they like to shoot so you can have easier no’s in your business. Abby believes you will have a more fulfilled and happy business when you’re taking on the right clients. Your personal life is also affected by your business, so making the right decisions for your business will spill over into your personal life as well. Setting boundaries and saying 'no' will open up opportunities for you to say 'yes' to the right things in and outside of your business. Abby has set up her business in a way that allows her to spend more time with her family and friends and keep the business burnout to a minimum because she truly loves what she does. Your clients are looking to you to guide them in the process. Letting them know up front about your boundaries regarding when you do and don’t shoot, when you check emails, etc will be more beneficial in dealing with your clients than getting into the process and then letting them know. They will respect your boundaries, and if they don’t, that will be a red flag for you that they’re not your ideal client. Abby Grace is an international wedding & anniversary photographer for the old-school chic couple in love, based just outside Washington, DC. 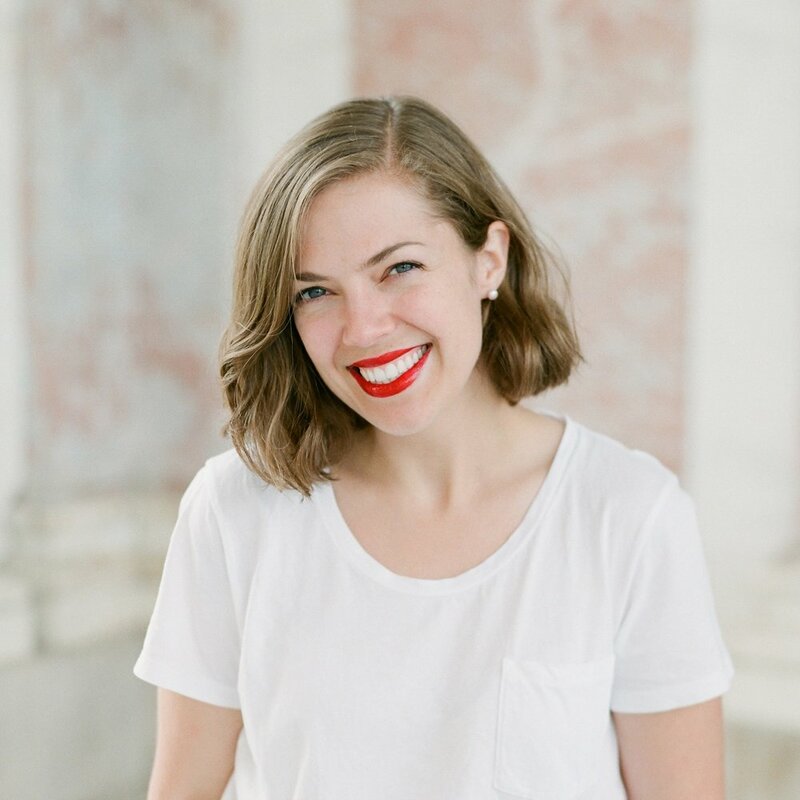 A Francophile, Hufflepuff, and ballet enthusiast, she’s had the joy of teaching creatives in France and across the US. She’s a communication guru with a passion for talking (degree in PR should tip you off) loves helping creatives get back to running a business they love that supports a life they love even more. Her secret weapon is a tube of red lipstick.